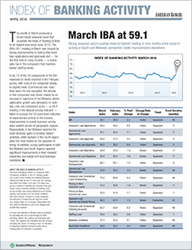 The American Banker Index of Banking Activity (IBA) rose sharply in March, reaching its highest level in nine months as bankers reported a strong seasonal boost in demand for consumer and commercial credit. The IBA is the leading indicator tracking potential changes in the level of business activity across a range of factors that are fundamentally important to the commercial banking business. Composite readings above 50 indicate an expansion of activity and readings below 50 point to contraction. The farther from 50 a reading is, the stronger the indicated change. The IBA is a product of American Banker's monthly surveys of more than 300 banking executives, conducted by SourceMedia Research. Visit AmericanBanker.com/IBA_Mar16 for more details. A majority of the components of the IBA, 12 of 16, trended upward, with the remainder holding steady to slightly lower. Consumer loan applications rose to 65.4 from the previous month’s reading of 59.2 while commercial loan applications climbed to 67.1 from the previous month’s reading of 60. For the first time in many months, there was a noticeable rise in the component that monitors banks’ staffing levels, which grew to 53.9 from 50.2. Deposit pricing, which registered 49.3, was the only component score that failed to surpass the 50-point level indicative of expansionary activity in the industry. The Index of Banking Activity monitors regional trends as well. Following are some of the regional highlights from the monthly survey. Northeast: The region produced strong readings in the components that track loan rejections. This may be indicative of demand from a higher quality borrower pool than some other regions. Midwest: The region recorded the strongest improvement in loan application levels as well as loans outstanding. West: Delinquency-related components, a very weak spot for the West in the previous month’s reading, rebounded to more neutral ground. South: The region had noteworthy gains in lending-related components, as well as indicators that track real estate and local business conditions. The index comprises a number of selected sub-indicators that summarize various business activities in banking, such as loan activity, loan pricing, deposit account activity, staffing, and business and real estate conditions. Each sub-indicator is based on survey responses that describe a change from the previous month (e.g., higher, lower, or no change). Respondents are also asked to elaborate on any of the changes. Monthly readings of American Banker's Index of Banking Activity will be presented as a time series that can be used to monitor the prevailing rate and direction of change in banking business cycles and eventually to benchmark whether an institution is operating in line with overall industry needs. SourceMedia Research is a unit of SourceMedia, providing research solutions for marketers, agencies and others targeting business sectors such as banking, payments, mortgage, accounting, insurance, employee benefits and wealth management. SourceMedia Research specializes in reaching senior and C-level decision makers through access to its large proprietary opt-in databases and panels. The unit manages the American Banker Executive Forum, a community of senior banking and payments executives who are committed to regularly sharing opinions and insights with the editorial and research groups at American Banker. Members include C-level executives and other senior professionals employed at commercial and community banks, bank holding companies and other financial companies across all asset classes. SourceMedia, an Observer Capital company, is a diversified business-to-business digital media company serving senior professionals in the financial, technology, and healthcare sectors. Brands include American Banker, The Bond Buyer, Mergers & Acquisitions, Financial Planning, On Wall Street, Accounting Today, Health Data Management, and Employee Benefit News.